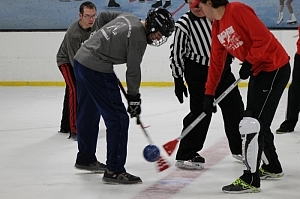 If you haven’t heard of broomball before, you’re missing out! It’s basically floor hockey on ice. Every player has a "broom" (it's really a stick) and you try to hit a ball into a goal. The league typically has a capacity of nine teams and generally sells out in advance of any posted registration deadlines. Some years the arena has less time available and we are capped at seven teams. Do not wait until the last minute to register if you want to play. Games will be played on Sunday evenings at Madison Ice Arena (725 Forward Drive). We use the studio rink, which looks just like a regular hockey rink, except smaller, so it's the perfect size for broomball. We also have use of locker rooms for the games. Broomball requires more equipment than many other sports. MSSC supplies the basics mentioned above in the "Format" section. 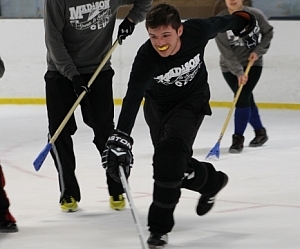 Players are encouraged to purchase additional equipment, such as broomball shoes, pads, mouth guards, and helmets from sites like Broomball.com, Midwest Broomball, or Amazon.com. These items are optional but will enhance the playing experience and help prevent injuries.